What is Black Friday, Anyway? Black Friday is mostly an American phenomenon. It’s the day after their Thanksgiving that really kicks off the holiday shopping season. A day where retailers offer huge savings on popular products. Shoppers climb on top of each other just to grab the last Samsung Smart TV for half price, not really caring at all that they’ve just given their neighbour a black eye. It’s all-out consumer madness, sort of like our Boxing Day, and it’s starting to seep across the border. Online retailers have begun to offer Black Friday deals, which means Canadians can now get in on the savings. 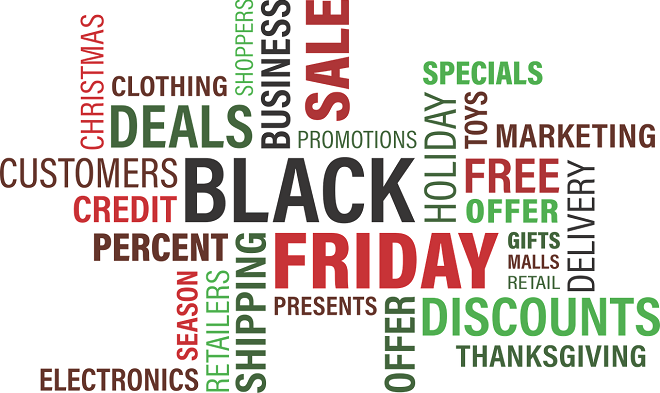 Many local retailers here in Canada have also started to offer Black Friday deals, as well. Combined with Cyber Monday, which brings all the deals to your online shopping the Monday after Black Friday, one can be overwhelmingly inundated with temptations to buy, buy, buy. It’s important on Black Friday, Cyber Monday and even on our own Boxing Day, to truly consider the things you are tempted to buy. Ask yourself: Do you need it? Were you planning to buy it anyway? Are you actually saving money on this? If these questions can all be answered with a yes, then you’re good to go. Anything else, and you’ll surely regret it. It’s easy to get sucked into buying things you don’t really need. When you see the newest game system at the lowest price you’ve ever seen it, you can’t help but feel like passing it up is a lost opportunity. Even though you never have time to play video games, and it would likely just sit there, collecting dust. What About Your Financial Well-Being? Giving in to all of this temptation, though, will have long-term effects on your financial well-being, as well as your credit score. If you’re out there grabbing all the deals, feeling that instant gratification, you will come home to a reality check. And you’re going to feel that reality check for a very long time. If good credit and financial security are priorities for you, you need to learn to ignore these temptations. Black Friday retailers want to draw you in and make you buy things you never needed, just because they’re at an incredible price. Don’t let a company have that sort of control over you! Even if it’s dirt cheap, if you don’t need it, you don’t need it! You are not saving money if you’ve just spent it on something you don’t need. No matter how great the sale is. Shiny new things are already tempting. Shiny new things at record low prices… that’s just cruel! But, we have to recognize that we do have control over our own choices, and we have to fight the temptations. After all, the best shiny new thing above all others, is a secure financial future.